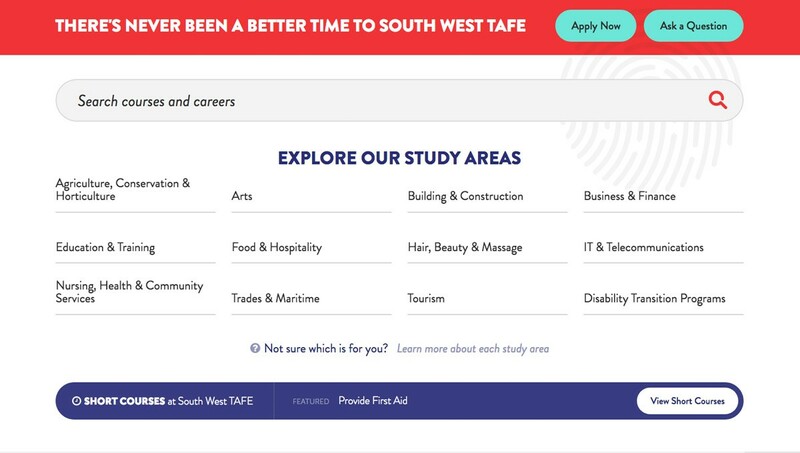 South West TAFE is the largest and highest regarded provider of skills training in south-west Victoria, with five main campuses delivering over 150 courses. They aim to provide future-focused education that creates a lifetime of opportunity and employability. 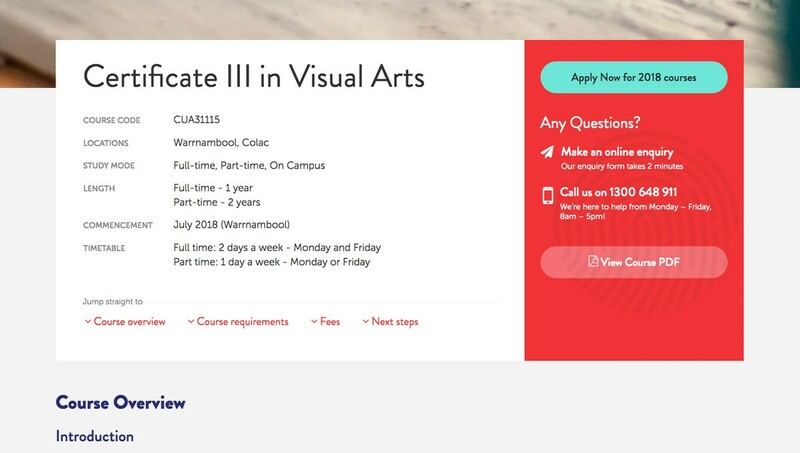 It’s vital that South West TAFE maintains a digital presence as dynamic as its student audience. So when the institution recently rebranded and redefined its business goals, it fell to Monkii to design and develop a bold, modern website from the ground up – one that could do it all. Monkii worked closely with South West TAFE to define key user personas, user journeys and conversion tasks – findings that informed all design and development decisions throughout the project lifetime. And we validated these decisions with real user testing at prototype stage. 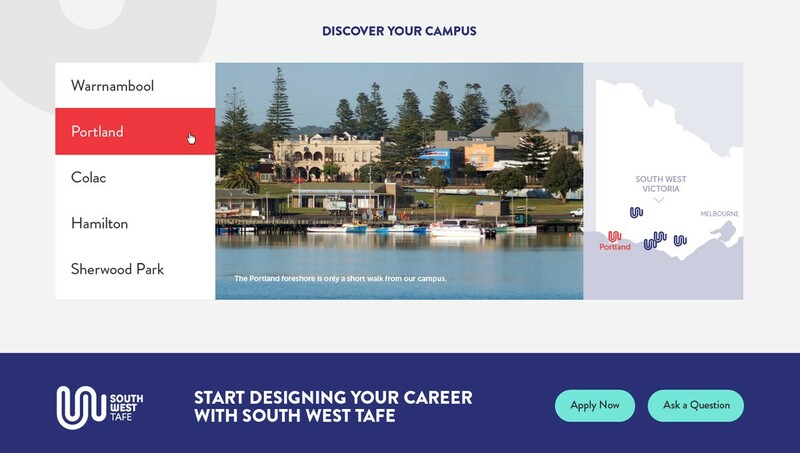 The TAFE sector is extremely competitive, so the website is engineered to grab attention and excite prospective and current students alike. Our use of video, strong colours, large imagery and attention to detail is an inspiring lesson in impact and engagement. The website won silver at the 2018 Melbourne Design Awards. Encouraging initial contact from prospective students is crucial to the site’s success. To that end, Monkii developed a “low barrier to entry” section for simple enquiries called Ask A Question, which has been a huge success. 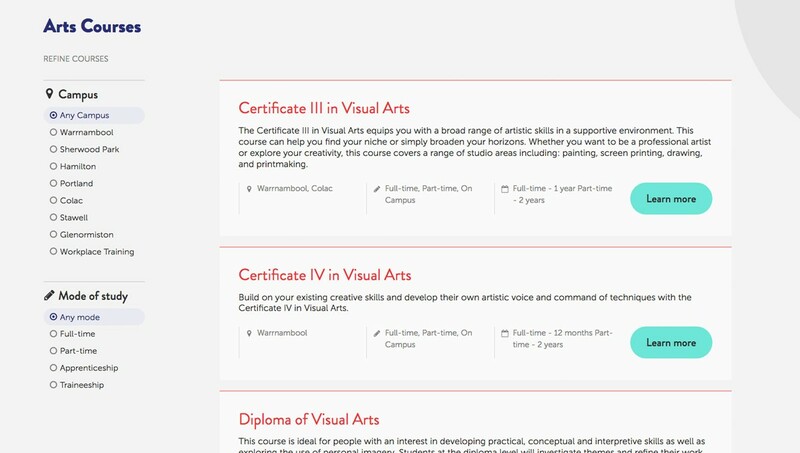 The website also successfully manages South West TAFEs Courses, News, Applications, Enquiries, Case Studies and supporting content. This is all built with Umbraco, the leading .NET open-source CMS. Across all levels of the organisation, South West TAFE is focused on student success. And with Monkii’s help, its website leads by example. Monkii were thoughtful and efficient, a pleasure to work with.